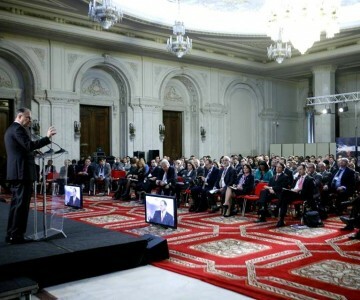 The Bucharest Forum is an annual event, with the 2012 edition between 8-9 November at the Parliament Palace, which gathered over 400 foreign investors, representatives of the Romanian business sector, large corporations, small and medium-sized enterprises and high-ranking officials. The Forum brought an important contribution to the debates on economic public policy formulation in Romania and the region. At the same time, it aimed at rebuilding and strengthening the trust of domestic and foreign, private and institutional partners, in the context of the latest political events and of a shattered political climate. The forum’s topic was Europe’s Frontier Economies: Equity for a Long Term Growth and Stability Strategy for the Region and it created a relevant reflection opportunity and influential platform for regional economic agendas and ideas. The forum overall serves as a blueprint for the expectations and needs for a functional return to sustainable growth. The end product is a Pact for the Economy, which represents a consensus between the representatives of the economic and political environments, on several jointly identified priority topics. The document comprises concrete proposals and an Action Plan proposed by the private sector to the incoming Romanian government and designed to accelerate the growth and development of the Romanian economy. This landmark economic event is organized by the Aspen Institute Romania, with support from AOAR – Romanian Businessmen’s Association, FIC – Foreign Investors Council and AmCham – American Chamber of Commerce in Romania. The cost of growth – fiscal and monetary policy in the non-Euro economies of the EU. The specter of low employment economy: investment and competitiveness in the era of high sovereign risk. Transversal solutions and sectorial priorities (energy, infrastructure, agriculture); regional opportunities – the New Silk Road strategy and economic implications for the Black Sea and Danube region.